As the first franchisee of the first LED lighting franchise in the U.S., Jamie Shapiro has learned plenty about venturing ahead of the crowd. LED Source was founded in 2005 and launched its franchise program in 2009. At that time, it was the first and only franchisor of LED lighting in North America. Shapiro knew the lighting industry due to his experience with his family's electrical distribution business. With backing from LED Source, he was willing to pave the way for other LED lighting franchisees. Here's what he's learned. For me it wasn’t about "why franchising" but more "why did I choose LED Source?" As the first franchisee of LED Source we bought into what corporate had visions for. We believed in Marcel and Gavin and the system that was put in place. There was help at every stage, from training to marketing support and even day-to-day technical help. As a franchisee you are in business for yourself but not by yourself and that was the major factor in our decision to pursue the franchise model. I was working in my family’s electrical distribution business. That is where I got my taste for lighting. My family’s business offered all types of electrical supplies but I just wanted to focus on the lighting aspect. 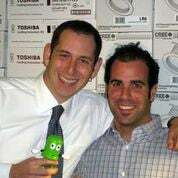 My business partner Mark Etcovitch has known the LED Source corporate team for a number of years. When they told him that they were getting involved in the franchise model, having been long time friends, Mark reached out to me because he thought I would be an ideal candidate to sign on. I flew down to Florida to meet Marcel and Gavin and it didn’t take long for me to realize that these guys were winners and I wanted to be a part of this journey. Upon my return home, I met with Mark for a good old Montreal smoked meat lunch and thanked him for the introduction. I was excited to tell him that I was in... if he was! We have been in business together ever since. That is how LED Source Eastern Canada was born. Our initial investment to open our doors was approximately $125,000 it included, area agreement, first franchise fee and typical start up costs including inventory, warehouse equipment, office furniture, supplies, etc. Family. When you are considering making a move which involves you leaving a ‘job’ to start out on your own, I feel that it is not only important to do your due diligence on your potential new business but also to make sure you have support from your family as there are no doubt going to be ups and downs. On the business side, I spoke to my father who had been in the industry for many years. I needed his opinion on whether or not he believed that LED lighting was really going to be the next big thing. I also approached my uncle, who is in the franchise business (not lighting) to see what he thought of my new business venture. At the end of the day, my wife was most important. She was the one that I needed to be on my side the most. I wanted to do this to better our future. The most unexpected challenge was absolutely the adoption of the technology. Marcel often speaks of a tipping point; which is the moving target that is the LED revolution. There is no question we entered into the market on the ground floor of an industry that was ripe to explode. We have had to ignore conventional wisdom and listen to facts and observe this market that is on the verge of changing the entire industry. Nobody said it would be easy. We have not only had to bring product and knowledge but there is a ton of educating that goes into each and every sale. Do your due diligence. READ the Franchise Disclosure Document. Get permission from the franchisor to speak to franchisees and ASK QUESTIONS. We receive a number of phone calls each month from prospects, asking us about our experiences. LED technology is moving at such a rapid pace that we are re-focusing on our target market. We are geared towards helping clients out in a number of spaces that we really excel. Architectural lighting, LED fixtures with controls and the horticultural industry. We also plan on expanding our growth into other provinces.